Hello friends! 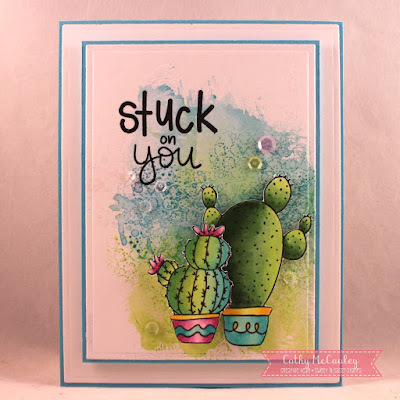 I have two rather prickly cards to share both here and over at the Sweet 'n Sassy Stamps Blog using the Refresh My Soul stamp set released last month along with the July Stamp of the Month, Texture Tiles 3. 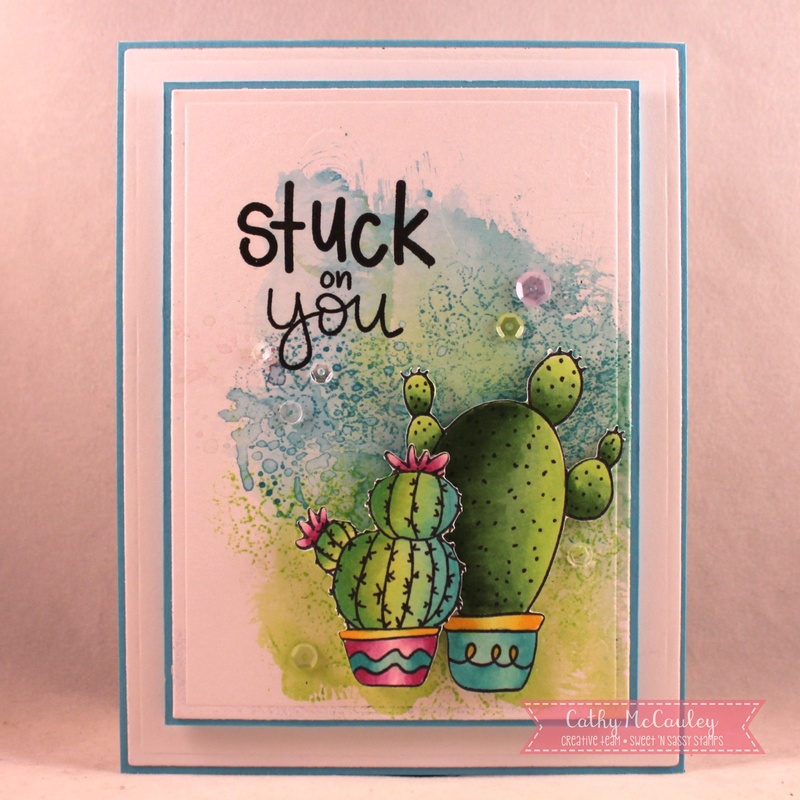 The adorable prickly cacti in the Refresh My Soul stamp set are so much fun! Creative Nugget: The background was created with Distress Inks and the bubble texture from the Texture Tiles 3 stamp set. The cacti were colored with Copic Markers, the sentiment stamped, and sequins added to finish the card. 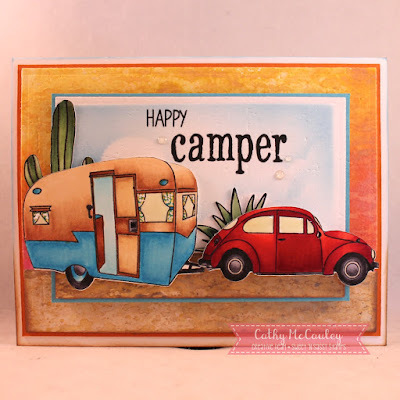 Creative Nugget: My second sample is a shaker card...how fun! The background was again created with Distress inks and Oxides. Sequins were used inside the shaker. Good morning, friends! Today we are taking another look at the ODBD July 2018 Release. 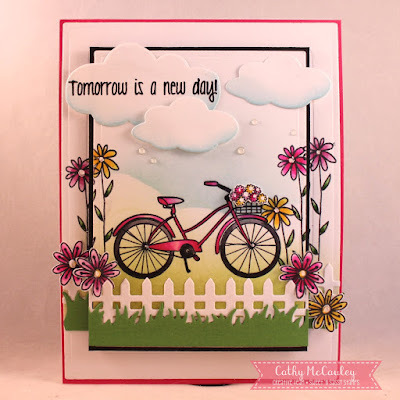 My project for today uses the new Hugs Stamp/Die Duo and the Tri-Fold Card and Layers Dies. Creative Nugget: The Tri-Fold Card and Layers Dies were used to create the base of the card. Papers from the Heart and Soul Collection were used for the layers. A Pierced Square die cut and an Ornate Heart die cut were popped onto the inside fold while hugs and kisses cut with Alphabet Dies were placed around the outside of the card. 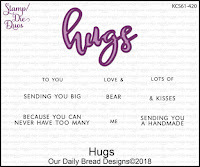 The Hugs Die was cut three times and layered on the heart and the sentiment was white embossed on a Pierced Rectangle die cut to finish the card. 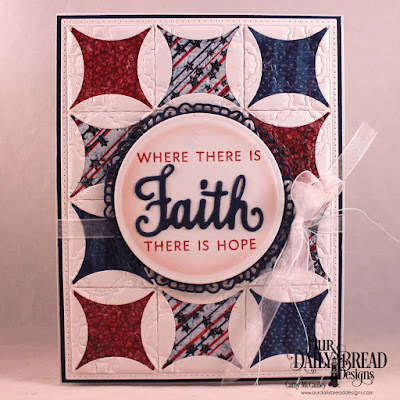 Be sure to check out the Our Daily Bread Designs Blog, Facebook Page, and Instagram to see more beautiful samples created with the July Release products by the Breadbasket Designers. Hello friends! 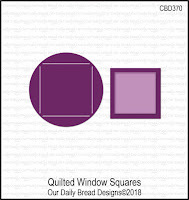 I have a second post for today because it's time for another Two for Tuesday feature over at the Our Daily Bread Designs Blog. Since I was in the mood for Christmas in July...I chose to feature the Winter Chickadee stamp set for my two cards. Creative Nugget: A little distress watercolor was splattered on the background to give texture to the white space. The chickadee from the Winter Chickadee stamp set was colored with Copic Markers and a sentiment from the set was heat embossed. The card was embellished with a few Pine Branches and berries. Other dies used from the ODBD Store include Pierced Rectangles, Pierced Circles, Circles, and Circle Ornaments. 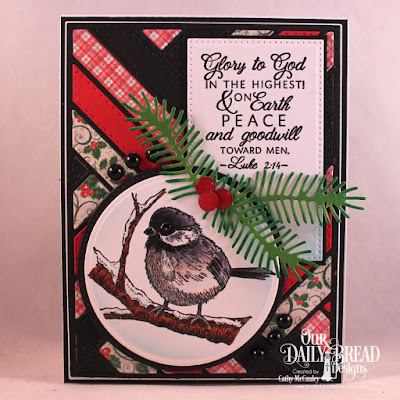 Creative Nugget: Papers from the Holly Jolly Paper Collection were added on the stepped up version and were cut with the new Quilted Background Die to create a Christmasy background for the little chickadee. Hello friends! I hope your week has gotten off to a great start. 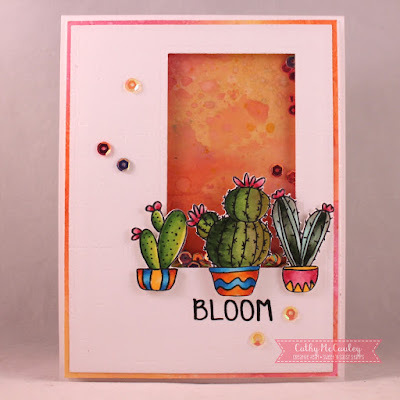 I'm sharing a couple of cards over at the SNSS Blog today using the new Go God's Way stamp set designed by Diane Noble for the Sweet 'n Sassy Stamps July Release. This set is wonderful for Bible Journaling and card making. Creative Nugget: A scene was sponged using Distress Inks and the bicycle from Go God's Way was stamped and colored with Copic Markers. Flowers from Itty Bitty Blossoms were added and the center of the scene was cut with a rectangles die, matted with black card stock and popped back into the scene. 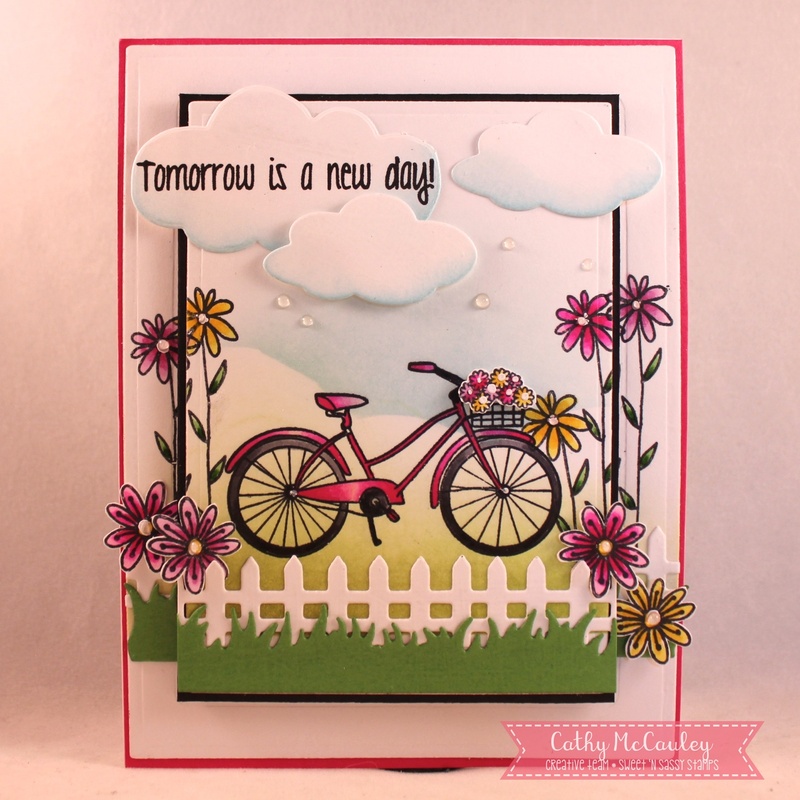 Clouds, fence and a grass border were added to finish the card. The sentiment is from the God is Bigger stamp set. 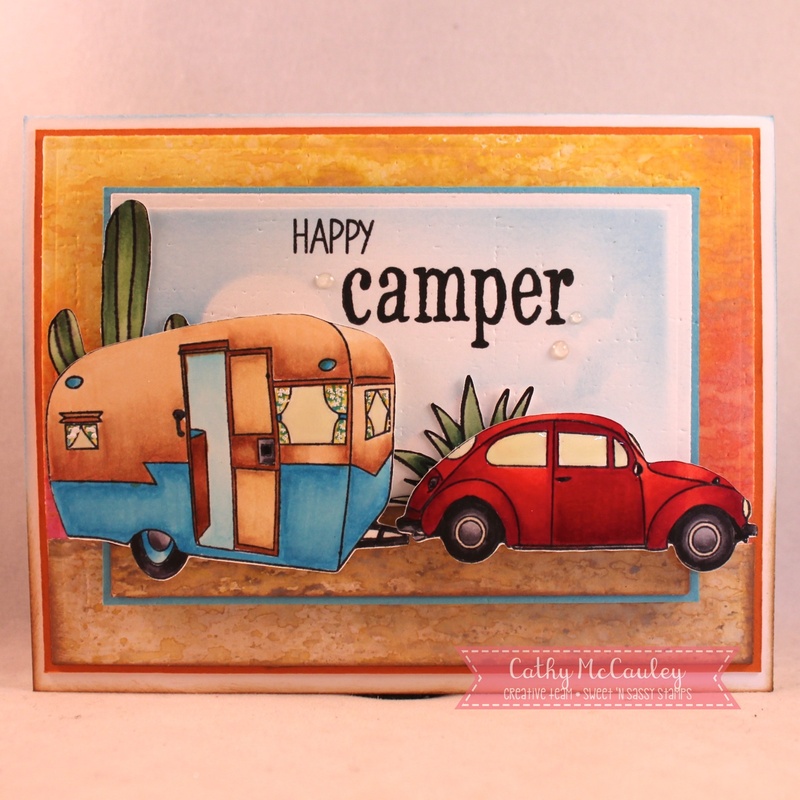 My second card features the camper and the car from the Go God's Way stamp set. Creative Nugget: The background scene was again created with Distress Inks and one of the textures from the Texture Tiles 3 set. The images from Go God's Way and Refresh My Soul were colored with Copic Markers, cut out and popped onto the card. The sentiment was made from the Scripty Thoughts Sets and the Mini Grunge Type Alpha. Until next time...keep rolling along! Thanks so much for stopping by...have a wonderful day! Hello friends! Hope those in the United States had a wonderful 4th of July yesterday. Today is Throwback Thursday over at Our Daily Bread Designs and the featured die for today is the Snowflake Sky Die. 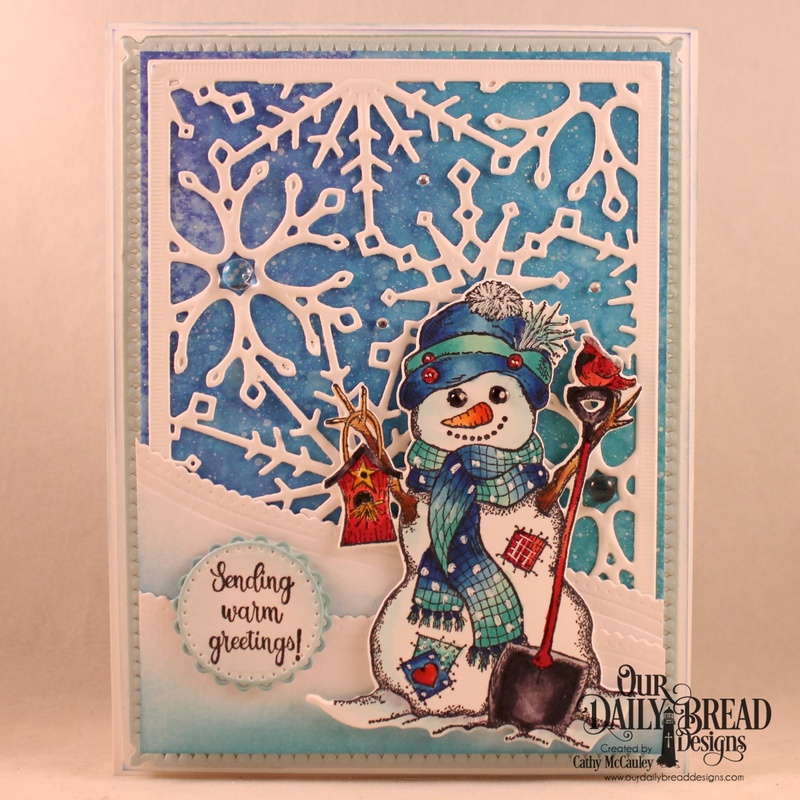 Creative Nugget: Distress Oxide inks were used to make the winter sky behind the Snowflake Sky die cut. A few slopes were made with one of the Leafy Edged Border Dies. The adorable snowman and sentiment are from the White as Snow Stamp/Die Duo...the snowman was colored with Copic Markers. A few gemstones were added to finish the card. Other dies used include the Pierced Circles and Fancy Circles. 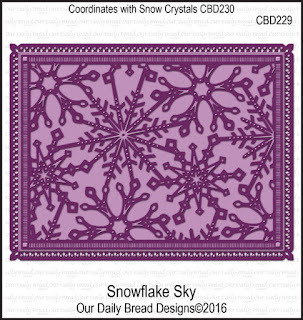 To see more samples using the Snowflake Sky Die head on over to the Our Daily Bread Designs Blog. Thanks so much for stopping by! Enjoy your day and stay cool! Good morning, friends! 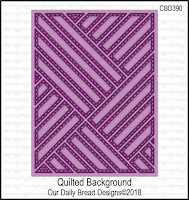 Happy July and welcome to the Our Daily Bread Designs July 2018 Release. This month ODBD is releasing two Stamp/Die Duos and another fantastic fancy fold card die with layers, and two quilted background dies! My first sample was made with the new Hugs Stamp Die Duo and the beautiful Quilted Background Die. Creative Nugget: Shabby Rose papers were cut with the Quilted Background Die and pieced back into the quilt. 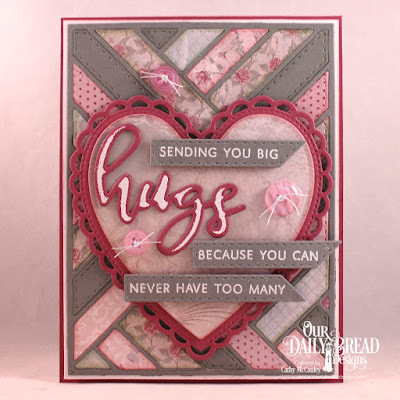 Sentiments from the Hugs Stamp/Die Duo were white embossed on leftover pieces from the quilt die. The hugs word die and the sentiments were mounted to papers cut with the Ornate Hearts Dies. A few buttons were added to finish the card. 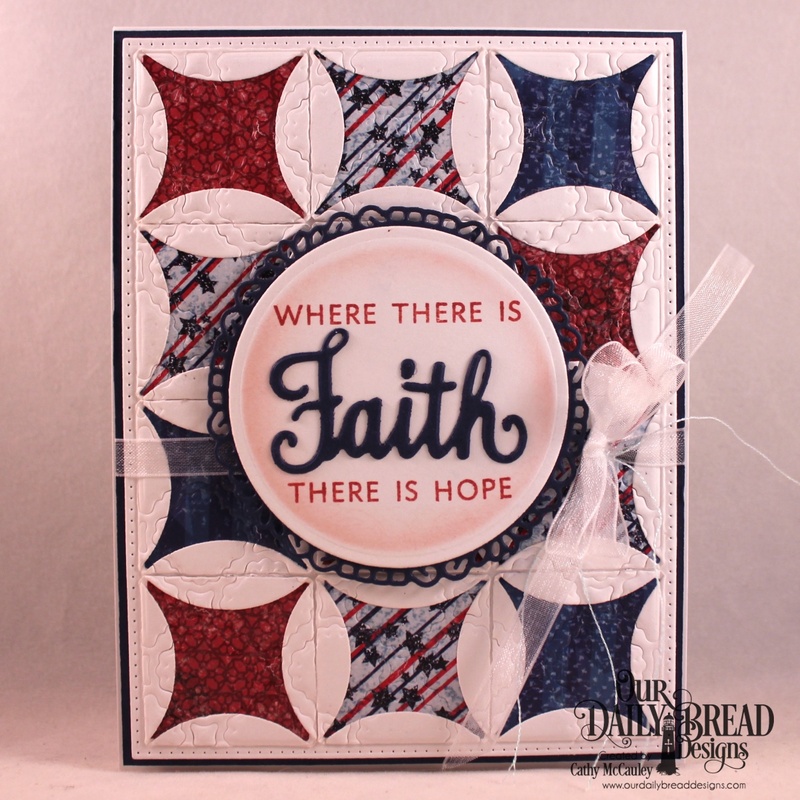 My second sample was made with the Walk by Faith Stamp/Die Duo and the Quilted Window Die. Creative Nugget: Twelve patches of papers from the Patriotic Collection and the Stars and Stripes Paper Pad were cut with the Quilted Window Die to create the quilt. The sentiment was stamped on a Circles die cut and mounted to a Fancy Circle die cut. 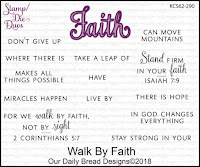 Faith from the Walk by Faith Stamp/Die Duo was cut and stacked twice and added to the card between the sentiments.